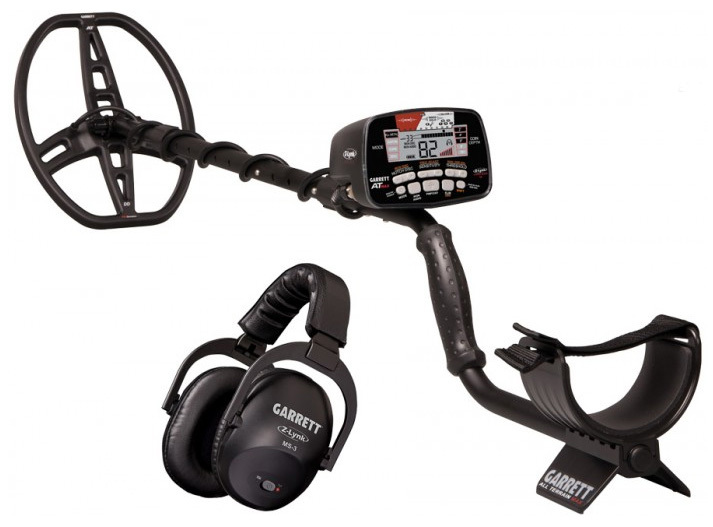 Garrett AT Max Metal Detector + Coil + Hat FREE SHIPPING! SPECIAL PROMOTION through the end of 2018 only, every AT Max metal detector shipment includes a FREE Pro-Pointer ($169.95 MSRP) with ZLynk (#1142200)! Pair it to the AT Max without the need for additional accessories. Get details on Garrett's most advanced and versatile pinpointer here. 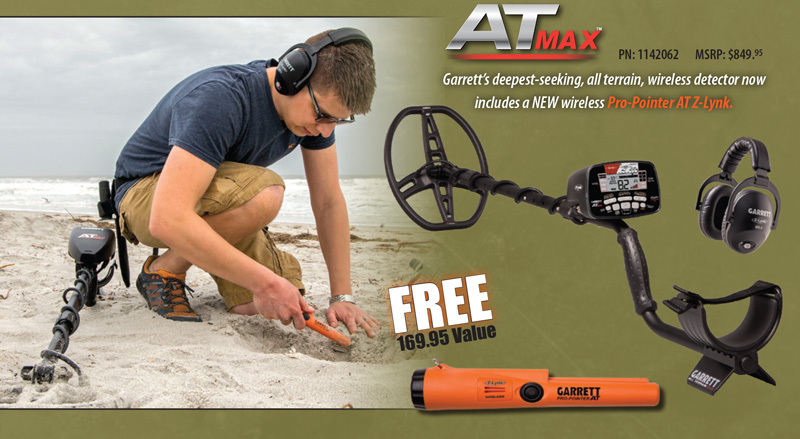 Built for the professional treasure hunter, Garrett's AT MAX is a versatile and advanced all-terrain VLF metal detector. With increased detection depth, built-in Z-Lynk Wireless Technology (near-zero delay of 17-milliseconds from your detector to your headphones), 6 times faster than Bluetooth speed, and up to 4 times faster than other wireless headphones, and many other improvements, AT MAX helps treasure hunters push their limits to the MAX! This metal detector's 13.6 kHz operating frequency provides excellent detection on a wide range of targets including silver coins, gold jewelry, and brass relics. It is highly recommended for: Coin, Jewelry, Cache Hunting, Relic Hunting, Organized Hunts and Water Hunting. Detector ships with Garrett MS-3 land-use wireless headphones, 8.5"x11" PROformance™ DD submersible searchcoil, coil cover, and AT Max logo ball cap. • AT Max Detector P/N #1142060 with NEW Built-in Z-Lynk™ Wireless Technology means you can cut the cord! Integrated circuitry transmits high-fidelity audio to your wireless headphones. Six times faster than Bluetooth speed! Auto pairing. No cables, and no interference from other wireless devices. MS-3 Z-Lynk™ Wireless Headphones fold down for easy storage and feature volume control (adjust signal levels to suit individual hearing requirements and to enhance weak signal) and comfortable headband and ear cushions. Speaker impedance: 8 ohms. Frequency response: 30-18,000 Hz. USB charging cable included. • Maximum Detection Depth Increased transmit power and enhanced electronics provides AT Max with significant depth increase. • True All Metal Mode detects all types of metal and provides the greatest possible detection depth and sensitivity. • Backlight illuminates LCD screen for improved visibility in low-light situations. • High Resolution Ground Balance- Automatic and manually adjustable for improved performance. Includes 175 points of Ground Balance resolution, allowing the AT Max to handle both conductive soils (such as saltwater beaches) and highly mineralized ground. • Automatic Ground Balance Window™ - Garrett exclusive feature will simultaneously ground balance to a range of values to help overcome localized ground variations. By reducing subtle ground responses, the Automatic Ground Balance Window smooths detector audio and allows the user to hear faint targets. • Larger Display Numbers: Digital Target ID number, Iron Discrim number, etc. • More Controls— All easily accessible with a single finger as you search. • Iron Audio™ - Hear discriminated iron (normally silenced) to avoid digging tricky, undesired flat iron items. • All Metal Iron Audio™ - Garrett exclusive feature that audibly identifies discriminated iron while operating in a True All-Metal Mode. • Adjustable small frequency shifts to eliminate interference. • All Terrain Versatility - Fully submersible to 10-foot (3 meter) depth. Weatherproof design also protects against dusty and humid environments. For underwater use, optional wired headphones must be used. • Digital Target ID—0 to 99 scale. • User can manually adjust the audio threshold (the constant background sound or “hum”) to better hear faint targets. • Proportional Pulse Width Modulation Audio audio response and Tone Roll Audio provide more target information and sharp, responsive target signals. • Four Search Modes:True All-Metal, Custom, Coins, and Zero Discrim Modes. • All Garrett AT searchcoils are compatible: 4.5" SuperSniper, 5" x 8" DD coil, 6.5" x 9" concentric coil, 8.5" x 11" DD coil, and 9" x 12" concentric coil. Download .pdf AT MAX detector owner's manual here.